Best Title Ever – Struttin’ With Some Barbecue | What is ML Reading? 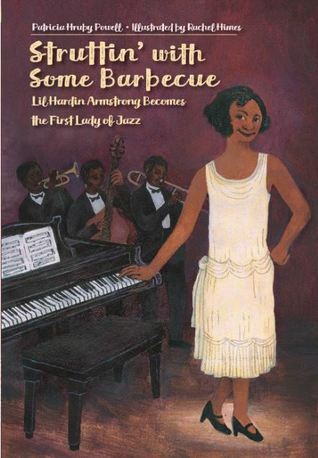 I loved Struttin’ With Some Barbecue: Lil Hardin Armstrong Becomes the First Lady of Jazz by Patricia Hruby Powell and illustrated Rachel Himes from the title on the front cover to the poem on the back cover. This biography written in verse is not to be missed. Lil Hardin Armstrong was a force. Without her initiative, Louis Armstrong wouldn’t have become the legend he did. Lil Hardin Armstrong deserves to be recognized as a legend too. This entry was posted in Uncategorized and tagged Patricia Hruby Powell, Rachel Himes, Struttin' With Some Barbecue: Lil Hardin Armstrong Becomes the First Lady of Jazz by mlreads. Bookmark the permalink.